Fuel consumption estimated at cruising speed of 15 knts. Ferretti has been known for quality craftsmanship and fast yachts with superb handling, and this 810 RPH superyacht certainly lives up to that reputation. It is a well appointed 24 metre yacht with overnight accommodations for six, plus two aft crew cabins for 4. The accommodation could easily be increased to provide another 2 berths as one of the cabins is fitted out as a small gym, complete with Sauna, jacuzzi and treadmill. The Flybridge has enough space to hold a decent party and the boat herself can carry up to 24 passengers in comfort. She has a very well fitted interior with a beautiful port side dining area just forward of the galley. This is a one owner yacht and has never been used for charter, hence the low hours on the twin 1500 hp 12v MTU power units. She has a top speed in excess of 30 knts and can cruise at comfortably at 25. Fitted with hydraulic Bow and Stern thrusters she is very manoeuvrable when docking but if you want to drop anchor further out she comes with a 175hp Sportsjet tender that will rapidly get you to your destination. She is priced to sell, and sensible offers will be considered. 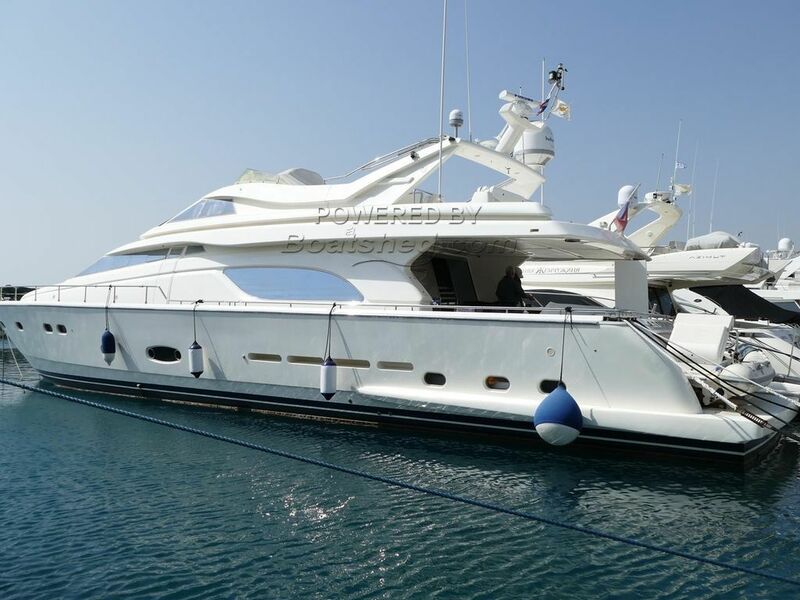 This Ferretti 810 RPH Flybridge has been personally photographed and viewed by chris curry of Boatshed Cyprus. Click here for contact details.